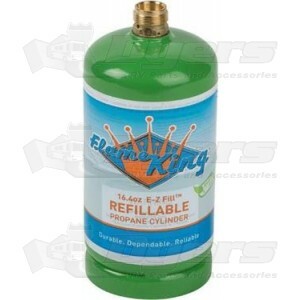 THE SMARTER ALTERNATIVE: The Flame King(YSN Imports) 1 Lb Refillable Cylinder pays for itself! Buy two or three refillable cylinders and you’ll celebrate your choice to save money and reduce pollution. Be sure to join the next generation of campers, BBQ cooks and tailgate party chefs who choose to re-use. Show your love for the environment! Choose the bright green solution for cooking outdoors! No more taking up space with multiple tanks and no more throwing them out when you're done! Simply refill and reuse. THE PROBLEM: Tens of millions of disposable 1 lb propane cylinders are manufactured and sold each and every year. You spend around $3.00+ per cylinder, just to be able to use about $0.30 worth of propane in the cylinder. When finished with them, how do you get rid of them? You either sneak them into your garbage bins, since it is considered Hazmat waste and cannot go into regular recycling, or you call your local Hazardous Waste hauler. Most people leave them behind at the parks where they used them or accumulate a pile of them in their garage. Some people buy adapters to refill them, which is not only illegal, but also dangerous, as they are not manufactured to be refilled. These propane cylinders fill fastest & safest with our commercial Flame King refill adapter - included with the PROPANE REFILL KIT. These refillable propane cylinders are for outdoor type applications that would fit a 1 lb disposable propane cylinder and 14.1 oz propane cylinder.